Star Trek 2009 | Cappa Toons! 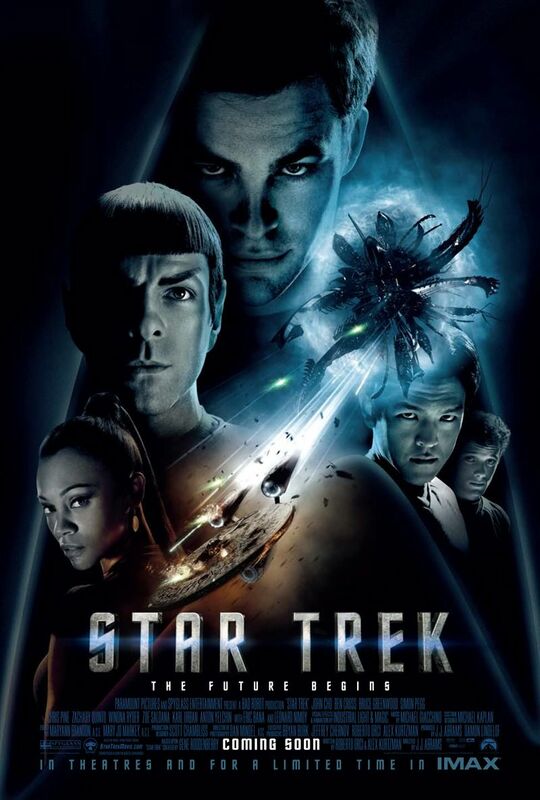 Before we reach the main event, Star Trek Into Darkness, we have J.J. Abrams first foray into Star Trek and his reimagining of the Original Series. I have mixed feelings about this film. First of all, I do like it. It’s a fun ride. It speaks with its own voice and style. The actors portraying the parts of the younger crew members do an excellent job capturing the spirit of the Original cast members, while doing their best to make those characters into their own. Obviously the hardest ones to do are Kirk, Spock, and McCoy, since those three have had the most established development. Oh, and Scotty. The four of them are icons in their own right. In this new Trek, Uhura, Chekov, and Sulu are given a lot more room to develop as characters. The Original Series rarely ever had episodes devoted to those characters, and even in the feature films, they always served as basic support in the background. We never really find out much about them. Here each of the supporting characters is given their due and a moment to shine. Leonard Nimoy shows up here as Elder Spock to give the new crew their send off. Star Trek is full of action, and for the most part delivers the goods in its efforts to reinvigorate the franchise. My problem is I’m not sure if in the back of my mind I accept these reimagined characters as Star Trek. The idea is to create a younger hipper version of the original series, and the film does that well. But it’s a different kind of energy than I’m accustomed to. The Star Trek franchise has always had plenty of action, but it’s pacing is also a signature of every series. I’m not saying it’s supposed to be slow, but I’m not sure if this new Trek holds true to the vision of Roddenberry. A lot of Star Trek is about diplomatic relations with other alien civilizations. This crews mission is a bit of a by the numbers “save the world” scenario. The aliens we meet are all familiar, with the villains being the Romulans. From what I see in this film and the next one, Star Trek Into Darkness is keeping things in the familiar zone, with familiar villains, aliens and situations. Where is the quest to seek out NEW life and NEW civilizations? This is one of the reasons I have difficulty accepting this new franchise. The new Trek offers the opportunity for new adventures by having the characters embark on an alternate timeline, which means the opportunity for new stories, not reexamining old ones from a different perspective. The other major problem I have with this movie is a lack of a relationship between the hero (Kirk) and the villain (Nero). This is a problem I have with a lot of movies, where the villains are developed behinds the scenes where only the audience can see them. But having the hero and villain meet at the climax of the movie gives us no emotional connection between them. How are we supposed to invest in the battle of two titan characters don’t really know one another. From Kirk’s perspective, the Romulan ship wiping out planets is a faceless enemy, except with the occasional video message from the villain. Nero only has a relationship with Spock, who in this case is a secondary player. If anything, more effort should have probably been put into telling the story from Spock’s perspective. See, here’s the problem. This movie doesn’t do enough to show it’s commitment to reinvigorating the franchise. By that I mean, because of the change in the timeline, they have opened the series up to develop in its own way. But it doesn’t want to commit to allowing Kirk to grow more as a character (and in his own way). We see Kirk as the wild stallion he is, refusing to take orders on occasion, being brash and antagonistic towards authority. At the same time he is restrained from being allowed to grow on his own as a character. They don’t want to make too much of a departure from the Captain Kirk we all know, which aligns with the series goal (and problem) of always sticking with the familiar. Kirk doesn’t get to change into a new type of Kirk. It’s an alternate universe. It doesn’t make sense to hinder his development and tell a story where life shapes him in a new way. Being the brash individual that he is, it doesn’t seem like he changes much or learns anything by the end of the film. He doesn’t have a problem that really haunts him. Maybe that’s the point, but his overconfidence also never gives us any doubt he will have a problem becoming Captain of the Enterprise. The only one in his way is Spock, who he makes it a point of not listening to anyway. If anything he basically learns to be more accepting of Spock. But the Kobiyashi Maru test never gives him anything to think about accept to focus more of his antagonism on Spock. It is really Spock who is the one going through major development as he begins his quest to understand his human side. Which is why I felt the film should have made more of an effort to make Spock the hero since this seems more like it’s his story, and he’s the one fighting to come to terms with himself. He is also the only one who has a relationship to the villain. This is also one of the reasons i preferred the supporting characters, Uhura, Chekov, Sulu, as they were all allowed to develop as characters in their own way. I like that this film seems to show unique interpretations of these characters and each of them never tries to be like their older counterparts. Uhura especially is unique because she is not like the more seasoned Uhura we know from the Original Series. We see her struggles as a young communications officer trying to find her place. Zoe Saldana really owns the character. The only thing I didn’t care for was her relationship with Spock, which seemed tacked on and underdeveloped. Their relationship never seems to play any part in the story. Their relationship seems more like it ties down Uhura, where I would have really liked to see her develop more as a character. Unfortunately, she sort of fades into the background after having some great development in the beginning. As for Scotty, I wasn’t as impressed with him. Simon Pegg nails his interpretation of Scotty, but the character is so iconic that it seems like he’s forced to do more of an impression than the new Scotty having a chance to grow in his own way. The new Star Trek isn’t great, but it’s a fun ride through the galaxy. One of the other things I like about this new version is the fact that there’s more in the way of traveling (even if it’s to places we already know). I’m siting this as a comparison to the other feature films, where the action usually centers around one planet or location. I am looking forward to seeing Star Trek Into Darkness when it hits theaters. Will it do a better job at allowing the characters to grow on their own? We shall see. In the meantime this version of Star Trek is acceptable, and enjoyable.